Jamie Lang has put his face - and dance moves - behind the new Volvic Juiced advert in what could possibly be the worst ad ever. It features Laing treating viewers to some rather shady dancing and even shadier fashion sense in a nod to the revitalising power of the fruit drink. The Made In Chelsea star is seen riding the underground and looking a little less than 100% as he almost drifts off to the music playing in his headphones. He is tired and struggling to get it together when all of a sudden he spots a bottle of Volvic Juiced in his pocket to introduce two new flavours on offer from the drinks giant. Things pick up big style from here on out as the opening chords of Walking On Sunshine by Katrina and the Waves chime in. Laing then jumps off at a stop called Chelsea and begins doing his best late-night wedding dancing impression as he goes all out with his dance moves. 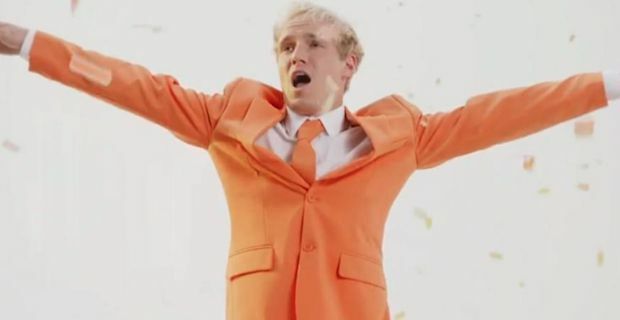 And he manages all this in a bright orange suit to advertise the orange flavour as well as a bright yellow suit in a nod to the lemon flavour. Jamie even manages to hold a giant straw as he dances and turns it into an air-microphone. Needless to say the 2 minute advert has divided opininons with @Jade_Mulders tweeting "@JamieLaing_UK rarely do I watch a YouTube ad till the end.. Just made an exception #WOW @volvic_uk #juicedsunshine #wastedinMIC". On the flip side of that, @habewe is quite unimpressed by the whole fiasco posting "Can't imagine how much @JamieLaing_UK must have felt a pleb during that new volvic ad 😳🙈 #cringe hahahahaha".